Having a baby is so much fun, but having twins will be double the fun!! 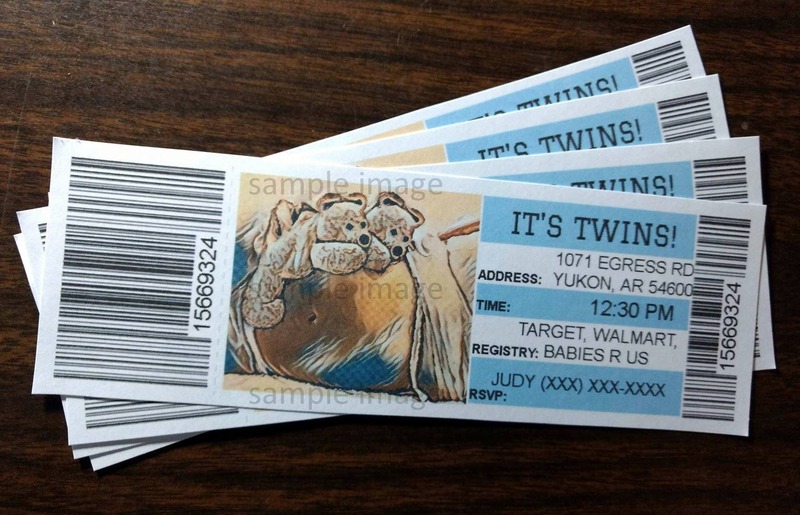 Here is a cute way to announce that you are having twins with these fully personalized invitation/announcement ticket printables. Each cut out ticket measures 7 1/4" X 2 1/2". They come 4 per sheet and you can print on cardstock or the paper of your choice right from home printer or any copy shop! They will be fully customized with all your information. You will get a sample image right after purchase...this is not your final image. Final images will be emailed to you!! Want a different picture? We can do that too! You will need to let us know all the details for your order by messaging us when you purchase. This is not a physical item. Nothing will be postal mailed to you. You will get a jpeg image file and a pdf file via email that will be ready for you to print as many as you'd like. Turn around time may take up to 24 hours (provided you send all the required information).